This racking system is known as a “Live” system, where pallets travel along an inclined track under the force of gravity. The tracks can be installed in a side by side format and they can be tiered vertically to produce a very dense block of storage racking. 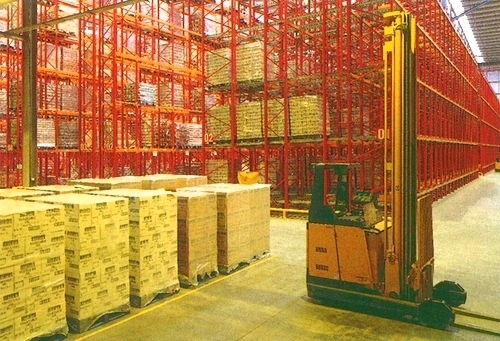 This racking system is loaded from the back by a fork lift truck and the pallets roll forward and are then picked in order from the front of the rack, which is a “first in first out” storage solution. Dexion produce two types of Pallet Glidestock which are Twin Track and Full Width Roller to accommodate a variety of pallet sizes and loads. Hampshire Mezzanine Floors can carry out repairs and safety surveys to existing installations. 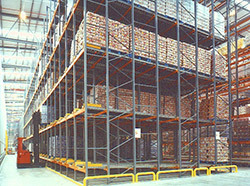 For further information on Glidestock Racking, please contact us to arrange a site survey.